...Scales? These can be fun. I agree. Some are very well made and can be decorative as well. I like the pointers on your scales. I have this W.T.Avery from the old country. You need a set of weights as well. Marked "standard" on the top so likely part of an inspectors set. These used to wear on the bottom so to adjust them they used to drill a hole into it and plug it with gold. The gold being heavier than the bronze made up the missing weight. At one time I collected coin scales--all since sold. What I liked the best (and kept) are some E. Howard, Boston signed postage scales; I also have one signed by his brother. These are rare and GREAT association items with my extensive early Howard collection. 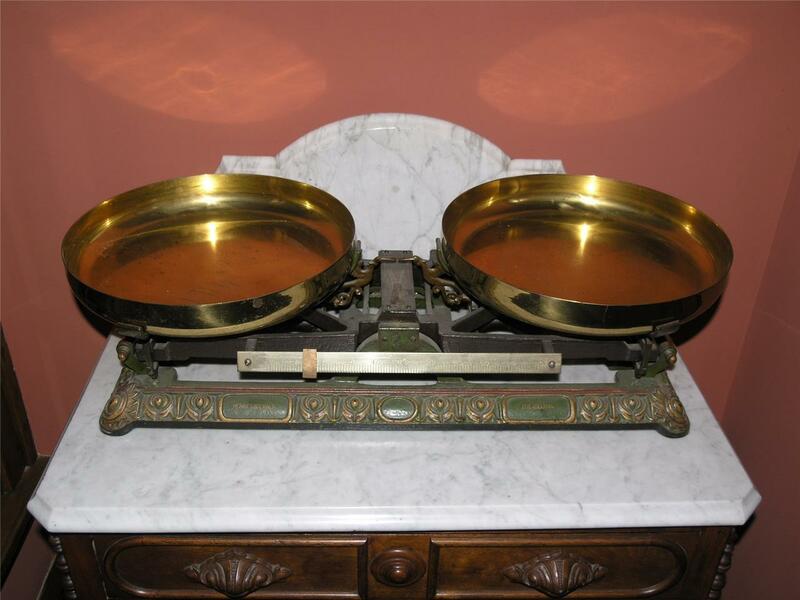 I have a few other sets of weights, they are a lot smaller than scales, and this is the most interesting I have. At one time they were a government standard, and would never have been touched by human hands. You had to wear gloves. They would only have been used in the test lab for checking other lesser standards. The tweezers are bronze with ivory tips. There is a glass cover over the smaller ones to protect them. I have a very nice set of NIST-traceable class 0 weights that stay locked in my office, along with a couple of much more accessible class 1 weights. All of them are in wood/velvet lined cases with ivory tipped forceps. The Class 1 weights are my "working weights" to calibrate department balances, while the Class 0 only come out occasionally to check the Class 1 weights. I have a couple of single pan substitution balances around my office. They aren't particularly attractive like some older ones, but are mechanically fascinating(to me) and also work quite well. The guy whose job I now have at work(after his retirement) has promised me a couple of two pan Chain-O-Matic type balances-I've admired those for a while(and used a few) but don't have any at the moment. I was working at the State Weights and Measures office when it was closed down after everything went Federal. They had some fantastic stuff there and most of it was sent to auction. Much of it went to scrap I suspect. I remember there was one set of weights that were offered to the museum. They initially declined saying they had enough such things. When it was explained to them that these were primary State standards made from solid platinum they had a change of heart. Ben, You might like this one. My other scale. Really I don't collect these. I always admired those scales in a nice wooden case with the sliding doors front and back. Kept my eye out for years and finally stumbled across this one in an army disposals shop. They had been a bit rough moving it and the beam had got all messed up and tangled in its supports. Sold it to me as a non working item. Luckily all the agate knife edges were in tact. The wheel on the side is connected to the scale at the top and also the drum in the middle. There is a chain with one end on one of the pans and the other end suspended by the drum via a fine cord. As you turn the wheel it moves the pointer along the scale and at the same time it pays out the cord. This adds weight to the scale end of the chain. The scale is calibrated in 1mg with a 0.1mg vernier on the moving part. Has the usual raise and lower of the beam to set the scale in motion. Also has spring loaded fingers that come up under the pans to steady things. When you press a button on the front they lower. Made in New Rochelle N.Y. by Voland and Sons. I do not know how old it is.